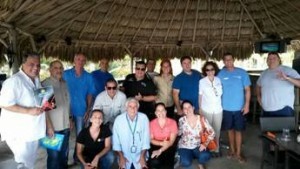 On Thursday May 28th, Bonaire Welcomed Sundance Air Venezuela on island. 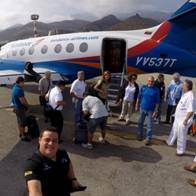 The airline planned a one day fam trip inviting the most important dive centers in Venezuela. The objective of the airline is to secure regular flights to Bonaire with a fleet Jetstream capacity of 19 seats. Arturo Barrios owner of Bonaire Hydrotest & Maintenance BV (www.bhmbv.com), is the official representative of Sundance on island. Their ground handling representative will be Jacinto Cicilia from Progressive Air Services. The airline compiles with all air regulations. At the moment the airline charters for the oil companies Repsol and PetroSaudi. Lately also with Halliburton, Cardon IV (ENI-Repsol-PDVSA). It is also developing alliances with Schlumberger (Germany) – Total (France) and Chevron (USA). It also maintains charter operations towards the North and South Caribbean (Aruba-Bonaire-Curazao-Trinidad-BarbadosSta.Lucia-Rep.Dominicana).